When it comes to the mass uprisings in the Arab world, much of the Australian media has followed the US agenda. Our media pays close attention when an anti-US government faces mass protests – like in Iran. This is democracy promotion that the US government supports. When a client state is at risk, the Australian media overwhelmingly falls into line: democracy only matters if it serves the interests of the US government. This thesis can be tested in a few ways. For example, the Syrian government gives some support to the Palestinian Hamas, and Lebanon’s Hezbollah. Hezbollah is known for its effective guerrilla warfare against Israel’s occupation of Lebanon, and for its leader Hassan Nasrallah’s fiery speeches against US foreign policy. Almost two weeks ago, there was a massacre in Houla, in Syria. According to the head of the UN team of observers, General Robert Mood, about 92 people were massacred, 32 of them children. While there was some evidence suggesting that the Assad regime was responsible, General Mood, according to leftist Lebanese paper Al-Akhbar, refrained from apportioning blame. Australia swiftly responded. Foreign Minister Bob Carr expelled both Syrian diplomats. This decision was reportedly made ‘easy’ by seeing what had happened in Houla. He was ‘assuming’ Assad was responsible. One might pause to remember: the Israeli government killed hundreds of Palestinian children during its attack on Gaza in 2008-9. Yet the broad range of reports condemning Israeli war crimes – from the Goldstone Report to Amnesty International to Human Rights Watch to others – was not enough to persuade the Australian government of any vaguely similar conclusions to those which Carr assumed in this case. One might regard the Murdoch press coverage of Arab uprisings as a biased selection. So, let us turn to Fairfax. As a representative example, Paul Daley informed readers that this was a question of no less than our ‘collective human threshold when it comes to the tolerance of evil in our world’. How could we be anything but appalled when ‘we have witnessed a series of sieges and massacres, as well as the brutal repression of peaceful protests’? Finally, Daley claimed, we must say ‘Enough!’ – the expulsion of the Syrian diplomats was ‘long overdue’. Fairfax’s Middle East Correspondent Ruth Pollard has also been an unabashed campaigning journalist when it comes to Syria. The headline for one February article screamed: ‘UN veto “gives Assad a licence to kill”.’ That quote came from well-known liberal democracy Qatar, quoted uncritically by Pollard as a country concerned about Syria’s repression of protesters. The US ambassador to the UN, Susan Rice, said the US was ‘disgusted’ the two countries were preventing UN action on the deepening crisis. ‘This intransigence is even more shameful when you consider that at least one of these members [Russia] continues to deliver weapons to [Assad],’ she said in the UN. Presumably, one could get the impression from Pollard’s reporting that the US is ‘disgusted’ at the thought of arming a dictatorship brutalising its own people. 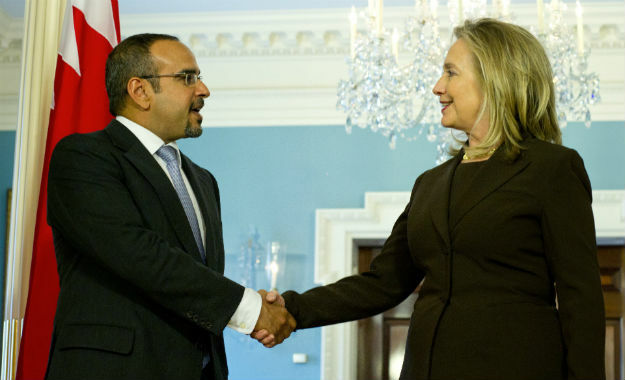 On 9 May, Hillary Clinton warmly welcomed Bahrain’s Crown Prince. I am delighted to welcome His Royal Highness here to the State Department. Bahrain is a valued ally of the United States. We partner on many important issues of mutual concern to each of our nations and to the regional and global concerns as well. I’m looking forward to a chance to talk over with His Royal Highness a number of the issues both internally and externally that Bahrain is dealing with and have some better understanding of the ongoing efforts that the Government of Bahrain is undertaking. we see hypocrisy. We see how they’re selling arms to Bahrain at the time where they’re killing their own people, and at the time they’re asking the Russian not to sell arms to Syria or to Libya at that time. … They are supporting the dictators here, the repressive regime. And they are not—I mean, when they speak also about the protests in Bahrain, they ask both party to stop violence, when we are protesting very peacefully. None of our people carry any arm. None of our people carry anything. So far, many people among our people were killed. At least 90 people so far were killed. At least thousands of people were wounded, where they will never go back to their life. At least thousands of people were detained or fired from work. … Unfortunately, the United States – and the West, as well, comes after United States – have ignored completely the crime what’s happening here. A wave of protests against Middle Eastern despots – and our government has taken a strong stance against one of them. This is an important operation for us and we rely intrinsically on the support of our friends in the Emirates and Bahrain. We have had I think in the better part of the last 20 years Australian naval units servicing various operations both in the Gulf and in the Arabian Sea. Currently the HMAS Melbourne is here. It’s out in the counter terrorism exercise, which rolls on. And episodically it engages in counter piracy exercises. We rely very much on our friends in Bahrain for porting facilities for the vessel. And also on top of that yesterday I spoke with our Australian naval commander who is responsible for the entire CT maritime exercises in the Persian Gulf with navies from three to four different countries. So you ask what we are doing in the region. There’s a few things. And we have been doing it not just in the last few weeks, but for the last 20 years. And that is all made possible by the strength and depth and breadth of the diplomatic relationship we have with the Gulf states frankly since the beginning. Given our close ties with the repressive Bahraini government, we would be in a strong position to pressure them to end their repressive measures and transition to democracy. So. Did we expel their diplomats? Cut ties? Issue ringing condemnations? On 18 February, Rudd urged ‘all sides to avoid violence and exercise restraint’. Sound familiar? He expressed the bland platitude that all efforts be made ‘to avoid further loss of life and injury’. Then, we ‘recognise steps taken by Bahrain on political and economic reforms. Further progress is needed.’ On 21 February last year, he praised the Bahraini authorities for their moderation. In March, Rudd expressed ‘concern’ and urged ‘maximum restraint’ by the Bahraini authorities. On 9 July, Rudd welcomed the decision of Bahrain to establish a Commission of Inquiry into human rights violations. He characterised it as ‘independent’. However, on 14 July last year, Australia bragged about its ‘strong and longstanding relationship’ with Saudi Arabia – one of the most repressive and misogynistic countries on the planet. Saudi Arabia invaded Bahrain to prevent the uprising succeeding. Rudd claimed Australia had a ‘constructive engagement with Bahrain’. That we engage with these countries ‘on broader regional and international issues’. In fact, Australia held its first Gulf Cooperation Council-Australia Foreign Ministers Strategic Dialogue forum on 8 March 2011, which ‘aims to expand peace, security and development cooperation between Australia and Gulf countries’. That is, less than a month after the uprising began, we improved relations with Bahrain. That about exhausts what our Foreign Minister has said about repression in Bahrain. Our media’s performance has generally been comparably shameful, but I should note that some have strongly condemned repression in Bahrain, like Chris Berg. The Global Mail’s Jess Hill has also seriously reported on the repression. And Fairfax? So far as I can tell, the only mention of Bahrain by Ruth Pollard was a brief comment in this article: ‘the bloodshed continues in the uprising in the tiny Gulf state of Bahrain.’ It would be easy to not know that, based on her coverage. The problem with Fairfax’s coverage of Syria isn’t that human rights violations there don’t deserve condemnation. Rather, it’s that it allows Australia and the West to continue to back dictatorships and repression, while posturing self-righteously as a champions of human rights. This is a disservice to the Australian public, which deserves to know about Australia’s foreign policy. More importantly, it is a betrayal of the brave people across the Middle East, struggling to overthrow the dictatorships we continue to support. 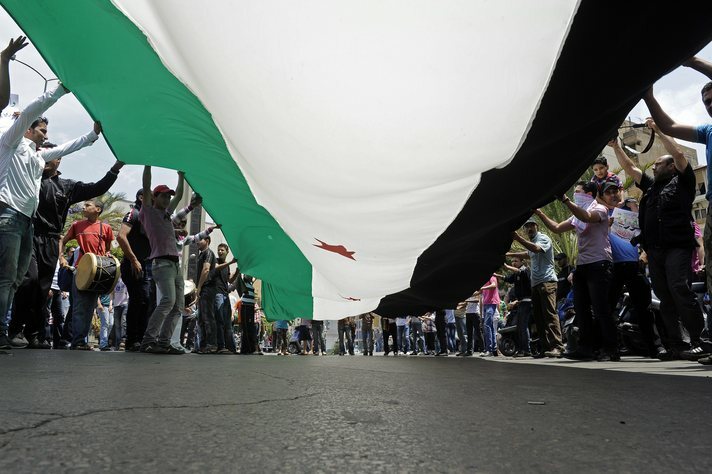 It is true that the article features a critical portrayal of the SNC and FSA, which have become Western favourites, and are backed by the GCC. It does not change the kind of uncritical reporting which I believe I demonstrated above. I should however say that it is to her credit that she did report in this manner. On Bahrain: I stand corrected. There was a second mention of Bahrain. In a 3621 word article (‘The people have spoken’, SMH, 17 December 2011), Pollard discussed the Arab uprisings. At the end of the story, there was a capsule summary of various countries. Besides a short paragraph on its king and Emir, I’ll post what it said in its entirety at the bottom of this. Amy doesn’t seem to understand my critique. She has written Pollard “is one reporter covering a whole region. OF COURSE you are going to be able to find gaps. doesn’t prove anything of substance”. If Pollard wanted to do important journalism, her coverage of Syria and Bahrain would be roughly the opposite of what it is. 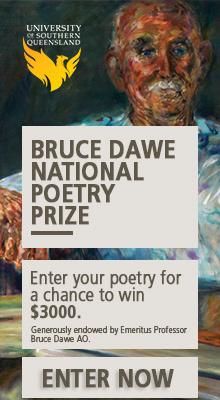 This just seems to be obvious to the point of banality. It’s exactly the same as how one would criticise Al Manar: it criticises Bahrain and ignores Syria, when, if it were courageous, it would be closer to the other way around. That is, one should disproportionately focus on crimes and atrocities by allies, which we can do something about, rather than complaining about crimes of official enemies, before posturing self-righteously about how we love human rights so much, and whether benevolent countries like us have a moral duty to invade tyrannous enemies. 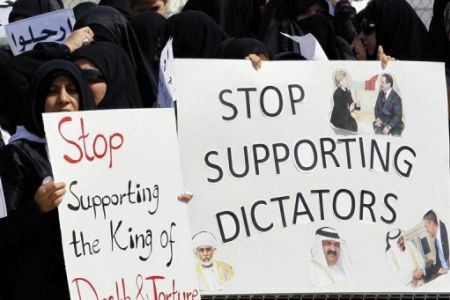 March 14: Saudi Arabia and Gulf states send troops into Bahrain to prop up the Sunni Al Khalifa monarchy after an uprising by the kingdom’s Shiite majority. Dozens of protesters are killed. June 29: Government-appointed commission of inquiry is established into the crackdown. September 24: Bahrain holds byelections to fill vacancies left by the main Opposition party Al-Wifaq, whose deputies resigned in protest at the government crackdown on demonstrators. November 23: Inquiry reports findings – 3000 people were detained, more than 4000 lost their jobs, and hundreds poorly treated in detention. December: There has still been little progress in talks between the government and opposition groups on political reform and there are daily clashes between riot police and Shiite protesters. Good article; I’m sure many Australians wonder at the contradictory positions in our international relations. This is an excellent posting. For some time now, I have wondered about the hypocritical support of the Australian Govt (as a client state of the US) for some Arab uprisings and its deliberate neglect of other struggles for democracy in the region. Also I think the Australian left generally needs to be more careful in its support of ‘the Arab Spring’ as I’ve seen too many uncritical references to it on this blog and other progressive and left-leaning magazines, blogs and websites. Now that we are going to get a pool of journalists who are not going to be paid, we might see a bit more honesty. I’m looking forward to the bloodletting, with journalism that is and not literally or the in M.E. Religion is the core of the problem in the M.E. and the West. Only when it is eradicated will there be a chance for peace.